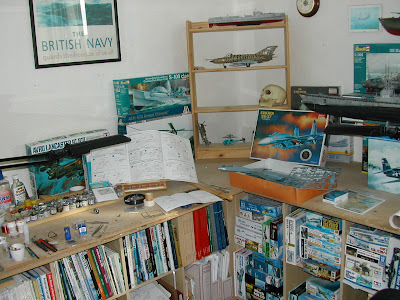 Philmodel: "You could clean up in here"
"You could clean up in here"
As a sort of addendum to the Flanker posting, I felt compelled to add this article, a story which I'm sure is familiar to fellow modellers. There are often times whilst in the grip of your latest project when the hours fly past, the trash level increases and cramp in your neck muscles from not looking up gets too much to ignore. I may even be a bit unshaven and red-eyed. It is usually at this point, whilst in full modelling flood (frenzy may not be too strong a word) that the door opens and in comes my wife. I know she's there, I can hear her thinking, and I know what she's going to say. 'You know, you could clean up in here'. A moment later, 'Shall I bring the Hoover in?' This well-meaning remark is never well received, usually being met with a growl and bared teeth. 'Is this a bad time?' With tweezers and cyano poised and an annoying itch on my nose, a grunt is all I can manage. 'I'll come back later'. She reverses from the room. Don't get me wrong, after a hard day at the office, my wife's company is the only kind I can stand. Let's put it down to timing. The point is, enthusiasm takes many forms. When I began work on the 'Flanker' I was moved to give my work room the long awaited make-over it deserved, and a good clean up. Unfortunately, my wife won't get to see the new look until I'm up to my armpits in the usual modelling detritus. Life goes on. How does your Falcon fly?